ONGC Notification is out. 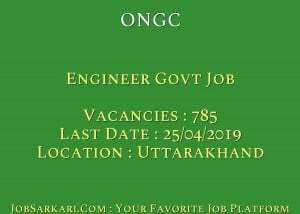 ONGC is recruiting for 785 Engineer Govt Job Posts. You can check ONGC - Oil and Natural Gas Corporation Limited last date, download ONGC notification, visit ONGC official website and check other ONGC Vacancy details.Complete Vacancy and recruitment Details about 785 Engineer Govt Job vacancies in ONGC are provided below by JobSarkari.Com only for you. Last Date of Apply Online. 25/04/2019 Up to 18:00 PM. Mode of Payment. Candidate Need to Pay Application Fee Through E Challan in Favour of ONGC Power Jyoti A/C No Payable At Any Branch of SBI. Candidate Must Have Appeared in GATE 2019 Are Only Eligible to Apply this Post. AEE (Cementing). Candidate Must Have Passed Graduation in Mechanical Engineering With 60% Marks. 04. 03. 02. 00. 01. 10. AEE (Cementing Petroleum). Candidate Must Have Passed Graduation in Petroleum Engineering With 60% Marks. 01. 00. 00. 00. 00. 01. AEE (Civil). Candidate Must Have Passed Graduation in Civil Engineering With 60% Marks. 09. 06. 02. 01. 01. 19. AEE (Driling) Mechanical. Candidate Must Have Passed Graduation in Mechanical Engineering With 60% Marks. 38. 25. 10. 05. 08. 86. AEE (Driling) Petroleum. Candidate Must Have Passed Graduation in Petroleum Engineering With 60% Marks. 03. 02. 01. 01. 01. 08. AEE (Electrical). Candidate Must Have Passed Graduation in Electrical Engineering With 60% Marks and Having Competency As Electrical Supervisor. 48. 27. 11. 03. 06. 95. AEE (Electronics). Candidate Must Have Passed Graduation in Electronics/ Telecom/ E&T Engineering/ Physics With Electronics With 60% Marks. 13. 05. 03. 02. 01. 24. AEE (Instrumentation). Candidate Must Have Passed Graduation in Instrumentation Engineering With 60% Marks. 16. 05. 03. 01. 01. 26. AEE (Mechanical). Candidate Must Have Passed Graduation in Mechanical Engineering With 60% Marks. 38. 17. 10. 05. 05. 75. AEE (Production)- Mechanical. Candidate Must Have Passed Graduation in Mechanical Engineering With 60% Marks. 29. 15. 09. 06. 05. 64. AEE (Production) Chemical. Candidate Must Have Passed Graduation in Chemical Engineering With 60% Marks. 36. 18. 12. 06. 08. 80. AEE (Production)-Petroleum. Candidate Must Have Passed Graduation in Petroleum Engineering With 60% Marks. 15. 08. 04. 03. 03. 33. AEE (Reservior). Candidate Must Have Post Graduation Degree in Geophysics/ Geology/ Chemistry/ Mathematics/ Physics/ Petroleum Technology/ Chemical Engineering/ Petroleum Engineering. 11. 05. 02. 00. 01. 19. Chemist. Candidate Must Have Passed Graduation in Chemistry With 60% Marks. 30. 17. 09. 05. 06. 67. Geologist. Candidate Must Have Passed Graduation in Geology/ Geoscience/ Petroleum Geology/ Geological Technology. With 60% Marks. 40. 13. 08. 03. 04. 68. Geophysicist (Surface). Candidate Must Have Passed Post Graduation Degree in Geophysics/ Geophysical Technology/ Physics With Electronics With 60% Marks, 13. 08. 04. 02. 02. 29. Geophysicist (Wells). Candidate Must Have Passed Post Graduation Degree in Geophysics/ Geophysical Technology/ Physics With Electronics With 60% Marks, 06. 04. 02. 01. 01. 14. Materials Management Officer. Candidate Must Have Passed Graduation Degree in Mechanical Engineering/ Auto Engineering/ Electrical Engineering/ Instrumentation Engineering/ Petroleum/ Applied Petroleum Engineering/ Chemical/ Civil/ Electronics/ Telecom/ E&T Engineering/ Computer Engineering/ IT/ Industrial Engineering With 60% Marks. 20. 06. 03. 02. 02. 33. Programming Officer. Candidate Must Have Passed Graduation Degree in Computer Engineering/ IT/ MCA/ Computer Science/ B Level Diploma in Related Field With 60% Marks. 09. 03. 01. 00. 00. 13. Transport Officer. Candidate Must Have Passed Graduation Degree in Mechanical Engineering/ Auto Engineering With 60% Marks. 05. 01. 03. 01. 01. 11. AEE (Industrial Engineering). Candidate Must Have Passed Graduation in Industrial Engineering With 60% Marks. 05. 02. 02. 00. 01. 10. Total Vacancy. 389. 190. 101. 47. 58. 785. UR/ EWS. Max 30 Years. Max 28 Years. OBC. Max 33 Years. Max 31 Years. SC/ ST. Max 35 Years. Max 33 Years. PH. Max 40 Years. N.A. 1. On GATE Merit Basis. 3. Candidate Have to Fill Their GATE 2019 Registration ID on Displayed Page. 4. Candidates are Required to Fill All the Details Carefully Like Name, Mobile No And E Mail ID. 6. After Save the Data System Will Generate the Registration Number And Password As Displayed on Screen as Well as Through SMS and E.Mail. 7. After Successful Registration Candidate can Log In with Registration No. and Password for Payment of Application Fee Through E Challan. 9. Online Applications Can Be Submitted on or Before 25th April 2019. Q. What is the Last Date For ONGC Engineer Govt Job Vacancy ? A. 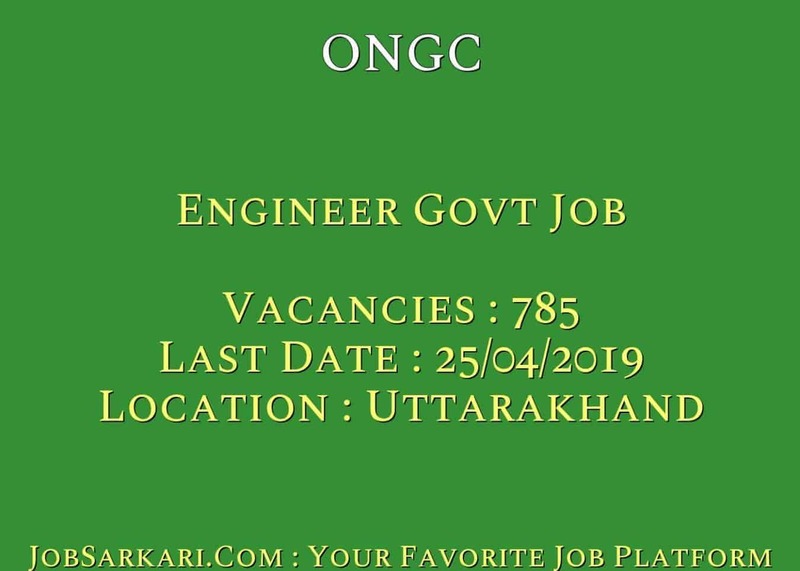 Last Date for ONGC Engineer Govt Job Posts is 25/04/2019. Q. What is the Form Type of ONGC Engineer Govt Job Recruitment ? A. The Form Type for ONGC Engineer Govt Job Posts is Online. Q. How many vacancies are available in Oil and Natural Gas Corporation Limited Engineer Govt Job Posts ? A. There are about 800 Vacancies in Oil and Natural Gas Corporation Limited Engineer Govt Job Posts.